Polycubes are polyforms made by joining equal cubes face to face. A reptile (or rep-tile) is a polyform that can tile an enlarged copy of itself. Little is known about polycube reptilings, because computing polycube tilings is lengthy and complex. See Polycube Reptiles. A bireptile is a polyform that can tile two equally enlarged, joined copies of itself. Any reptile is also a bireptile, because it can tile each of the two copies separately, and thus can tile the joined copies. Here I show only bireptiles whose smallest bireptilings use less enlargement than their smallest known reptilings. 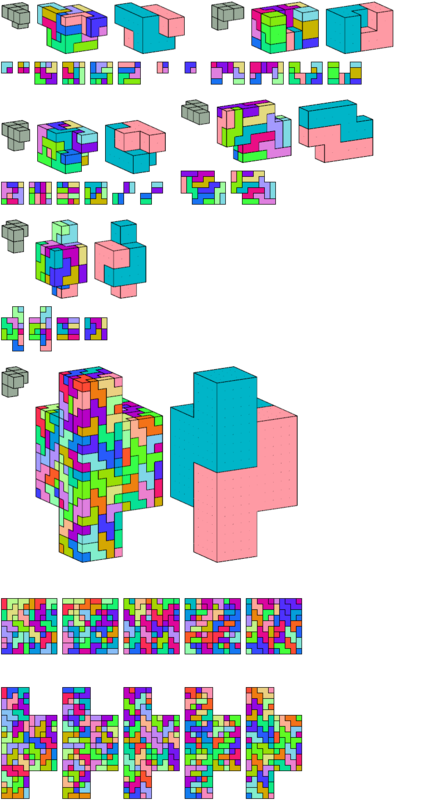 The monocube, dicube, and tricubes lack this property. See Bireptiles for bireptilings for other polyforms. In the tables, shading indicates that tile reflection is allowed. In the diagrams, cross-sections are shown from back to front.